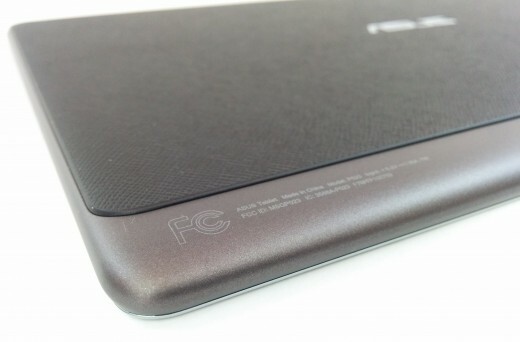 In mid 2015, Asus rolled out the new ZenPad brand which has ultimately replaced the existing Android tablet branding such as MeMO Pad and Transformer Pad. If you are familiar with the Transformer Pad, then you might consider the ZenPad 10 a successor to the trend setting Transformer tablet. The ZenPad 10 is more budget focused, but it does have the keyboard dock accessory just like the Transformer Pad. 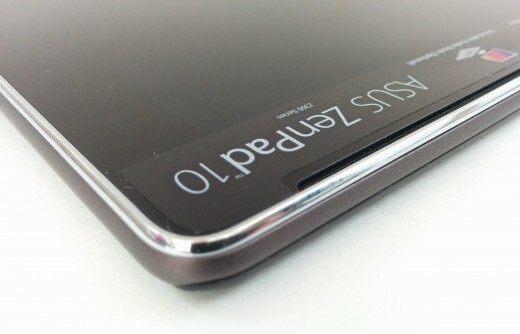 It also has something even more special which is Z Stylus compatability. The ZenPad 10 is available for a price of anywhere from $157 US to $179 US, making it virtually unbeatable for this budget range of Android tablets. For Asus to attain a low price point, compromises needed to be made which I will discuss in this review. Keep in mind that you’re still getting a lot of versatility and some features that simply aren’t available from other tablets in this price range. This review is going to approach the ZenPad 10 for what it is. It’s a 10-inch budget Android tablet that has an unbeatable price point. Note: We don’t yet have the Audio Dock keyboard accessory and it will not be part of this review. There are a few variants of the ZenPad 10 that you need to be aware of. In other countries you may have different camera specs. Some ZenPad 10 variants will come with a 5MP rear and 2MP front camera. The 4G LTE model (data only) Z300CL also comes with a different processor. This review should help you decide if the ZenPad 10 is right for you, regardless of the slight variants that exist on the market. Unboxing and holding the ZenPad 10 is interesting. The plastic design is nice to look at and the appearance doesn’t suggest it’s a budget tablet. It’s not the thinnest or lightest 10-inch tablet on the market, but by comparison I found it nicer looking and handling than the previously released Asus MeMO Pad ME302C. The weight and thickness is about average for this price range of 10-inch tablets. The rear of the tablet has two different textures. The main texture is a woven style plastic along with a narrow strip of smooth plastic running from the back, along to the side edge of the entire tablet. The plastic is hardened so it doesn’t provide much in the way of a tactile or soft feel, however it’s not slippery or uncomfortable to hold. On the front of the ZenPad 10 there are dual front speakers which are near the top of the display and not located on either side of the display like the ZenPad S 8.0 design. The front of the ZenPad 10 has a chrome trim that runs around the entire front edge of the tablet, providing a premium look. Sometimes finding the power button or volume buttons on a tablet can be a bit of a chore. 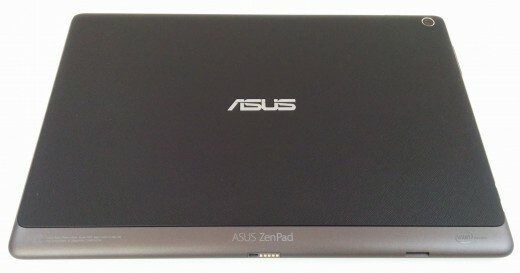 The nice subtle design with the ZenPad 10 is that the Asus logo can quickly provide you bearings as to button and port locations. 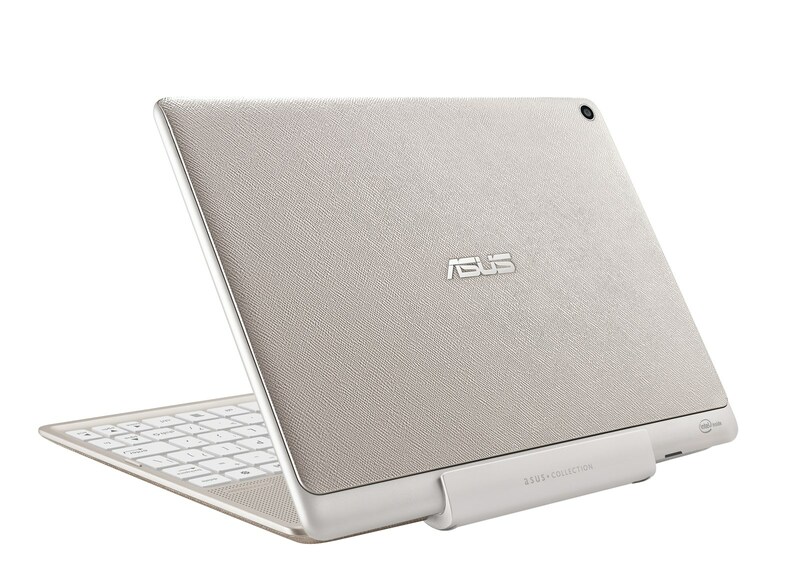 The power button is on the side above the logo and the volume buttons are on the side to the right of the Asus logo. It may sound subtle, but it is helpful on a regular basis. Look and feel wise, the ZenPad 10 provides good value. It’s budget without screaming budget. The ZenPad 10 is powered by an Intel Atom x3-C3200 Quad-Core, 64-bit @ 1.2GHz processor along with 2 GB of RAM. Through my tests of tasks from light to heavy, I found the ZenPad 10 performed well. I did not find videos, games or general use slowdowns. Obviously the ZenPad 10 isn’t going to win any benchmark tests in terms of performance, but for what you need, the hardware is up to the task. You can play high definition 720p video without a hitch and gaming apps aren’t resource hungry enough to slow down the ZenPad 10. I would suggest that a typical user is not going to find performance issues. I’m sure if you opened many apps and many tabs on your web browser you could discover performance issues, but in regular usage I had no problems at all. 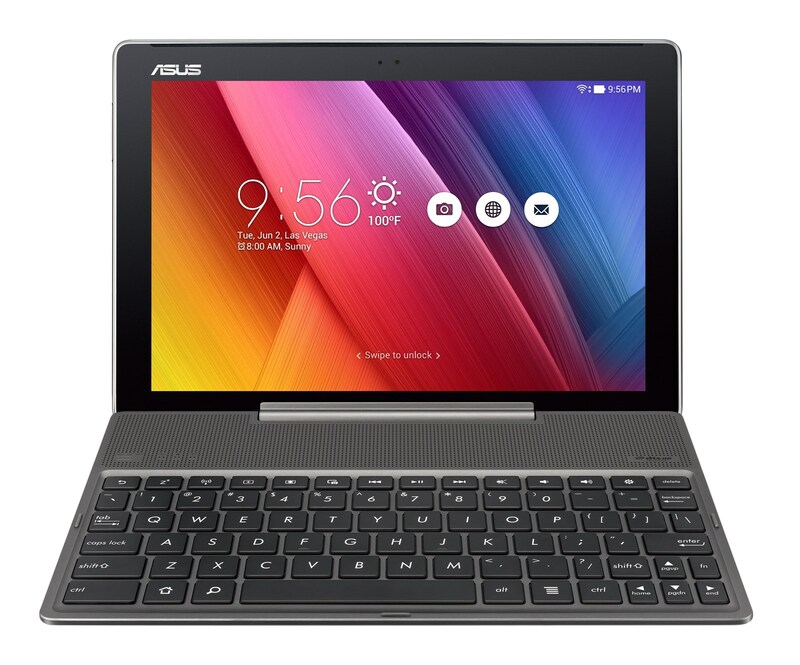 The ZenPad 10 is running Android Lollipop with the Asus ZenUI over the top. The ZenUI is deep enough in features that it’s worthy of a review on its own. What I can say is that ZenUI is a positive and not a negative. One aspect that Asus brings to the Android software is a bit more user friendly experience. It helps to take out some of the guess work (icons only) and bland aspect from the pure Android experience. If you want to delve into the features of ZenUI you’re going to need to download the ZenPad 10 online PDF user’s manual which goes into many of the tricks, tips and added functionality. The ZenPad 10 also comes with a variety of pre installed apps. I didn’t find these to be intrusive or problematic. Some of these pre installed apps are how Asus has been able to achieve a low price for the ZenPad 10 so I’ll gladly take the savings. It’s also worth mentioning that in a recent ZenPad S 8.0 software update, Asus enabled users to disable most of the pre installed apps. This type of update most likely will come to the ZenPad 10 although we haven’t heard any official information yet. With the low price point of the ZenPad 10 perhaps Asus will be unable to provide that feature in a future software update. If this update comes we will have full details on our site. I tested the ZenPad 10 in a few different ways. I decided to run tests in a more practical manner rather than relying on battery draining tests. If you want technical battery use information, graphs and comparisons, there should be lots of other reviews covering those particulars. I watched a high definition movie (letterbox aspect ratio) running from local storage. In my first test of 30 minutes with a full 100% brightness setting, the tablet battery drained from 100% to 93%. With a 50% brightness setting under the same conditions, the tablet battery drained from 100% to 94%. I ran a second movie with a 720p resolution (full screen ratio) from local storage for 30 minutes. In this battery test at 100% brightness the battery went from 100% down to 92%. At a 50% brightness setting, the battery went from 100% down to 94%. So with my video playback tests, a two hour movie at 100% brightness will cost you around 28%-32%. If you go to 50% brightness, you will use around 24% of the ZenPad 10 battery life. I will also suggest that running the tablet at 25% to 30% brightness will still allow you to comfortably watch a video but you will need to be in a dimly lit environment. Also you need to take into consideration what aspect ratio your video might be running at. A full screen video vs. letterbox will obviously affect the battery. More pixels to light up means more battery power required. In my 15 minute gaming test, Clash of Clans drained the battery from 100% to 95% with 100% full brightness. Using 50% brightness, the battery drained from 100% to 95%. Certainly a peculiar test result, so I ran a few other games to verify battery consumption. I can suggest that brightness isn’t going to play a major role in battery savings while gaming unless you go to 25% to 30% brightness. Overall I would describe the ZenPad 10 battery life as being sufficient. It’s not top of the class for 9-inch or 10-inch tablets, but it will get you through a day. Is one budget 10-inch tablet going to beat out the competing budget tablets by a large margin? Tablets built with budget in mind are going to end up with very similar hardware such as battery size. I don’t suspect the battery life results of the ZenPad 10 will be drastically different from similar 10-inch budget tablets. My usage of the ZenPad 10 during the review process really made use of standby mode. The ZenPad 10 would sit on the table in my office for hours or overnight. When powering it back up, I was more than happy with the results. Keep in mind that I’m careful about closing out all the apps running in the background before I set the tablet down for an extended period of time. If you are ultra conscious, you can make use of the ZenUI Power Saver settings to get even better standby time. If you really plan on pushing the ZenPad 10, then I will make the same suggestion here as I have in other reviews. You should consider picking up an external battery pack for anywhere from $15 to $30 which you can use for any of your mobile devices, not just the ZenPad 10. If you get something in the 10,000mAh size you will like have 2 USB ports and it will have enough charge for a tablet and a smartphone. We have an article here if you’re interested in buying an external battery pack. Ultimately your satisfaction with the ZenPad 10 display may be dependent on what other devices you have been using. If you are more familiar with higher resolution displays (retina), then perhaps the premium ZenPad S 8.0 will be more to your liking. The 8-inch ZenPad S 8.0 (Z580C) is priced at $199 US and features a 2K IPS display. 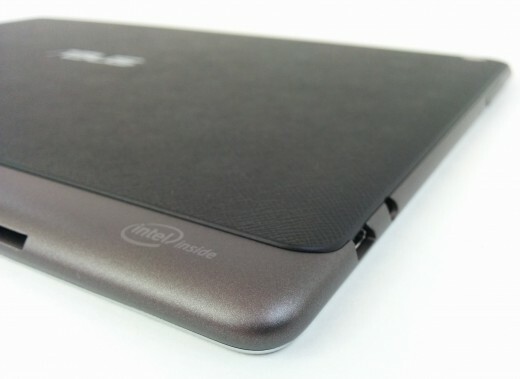 Keep in mind the Z580C lacks the versatility of the ZenPad 10 in terms of accessories. The ZenPad 10 features a 1280 x 800 resolution display which is pretty standard in the lower price range of Android tablets. If you’re more interested in a higher resolution tablet in the 9-inch to 10-inch size you are going to be paying at least double the price of the ZenPad 10. The ZenPad 10 display provides good viewing for videos and games. Your maximum video quality will be 720p with the 1280 x 800 resolution. If you’re on YouTube and you only see 720p available, that is why. The ZenPad 10 looks great with video and movies. The larger display makes for a nicer gaming platform and movie player in comparison to smaller 7-inch or 8-inch tablets. If you’re thinking the 1280 x 800 resolution may be an issue for games and movies, it’s not. It’s not retina quality, but clarity and sharpness is not an issue at all. I did find that the ZenPad 10 display isn’t an ideal for smaller text. This is most noticeable when you are looking at windowed tabs or system menus. Some smaller text is a bit fuzzy around the edges, but it’s still completely readable. I’m just suggesting where you might notice the resolution shortcomings of the ZenPad 10 will be in the fine print as it were. I could best describe it as a lack of crispness in small text. I found the maximum brightness of the Z300C to be more than sufficient. I did some side-by-side comparisons with the older (but higher resolution) MeMO Pad ME302C, and the ZenPad 10 has a brighter display. At 50% brightness, the ZenPad 10 is still very useable which will come in handy for those times when you need to really squeeze the battery life. If you’re really desperate to squeeze out longer battery life, I found that at 25% to 30% brightness you can still do what you need to do without too many problems, provided you’re not in a bright environment. With Asus choosing this resolution, it’s pretty clear that meeting a cheap price point was the top priority. If your eyes are not accustomed to high resolution displays in devices like the ZenPad S 8.0 or retina display devices, then I’m sure the ZenPad 10 display will be just fine. In my opinion the only place you will really notice the lower resolution is with text crispness. In terms of brightness the ZenPad 10 delivers good results. The dual front facing speakers in the ZenPad 10 are a big selling point. Most competing tablets opt for side or rear mounted speakers which results in audio being dispersed away from your ears and not towards them. Asus got it right in their design. The depth of sound coming out of the ZenPad 10 is fantastic! I’ve had a chance to use the other ZenPad offerings so we have some educated comparisons to offer. All the ZenPad tablets have front facing speakers but only the ZenPad S 8.0 and ZenPad 10 offer dual front facing stereo speakers. I noticed right away that the “Audio Wizard” settings have a far more dramatic effect on what you’re hearing out of the onboard speakers than with the ZenPad S 8.0 tablets. You can certainly push the bass to the point that the speakers cannot handle the output. The EQ settings can be used effectively and the presets give a good variance of sounds quickly and hassle free. On this basis, the ZenPad 10 makes better use of the “Audio Wizard” than the ZenPad S 8.0 series when it comes to the onboard speakers. I will confess that the audio is one of the best features of this tablet. Certainly it’s not easy to describe audio performance but I found the speakers (located along the top of the ZenPad 10) provided a wide, clear, stereo sound. If you are going to use this tablet for media and audio rich content, the ZenPad 10 should make you happy. If you’re not satisfied with the volume level, there are numerous media players such as Kodi that offer volume amplification. I ran some tests and the boost in volume does not affect sound quality and I was very impressed with the results. On the North American model of the Z300C you get a 2MP rear and 0.3MP front camera. Important to note that you may have a different camera specifications on the ZenPad 10 in your country; some countries will have a ZenPad 10 variant with 5MP rear and 2MP front cameras. If your country has the better camera specs, then I suggest you read our ZenPad S 8.0 (Z580C) review where we look at the cameras (5MP rear and 2MP front). This should give you a better idea of what to expect and we included some sample photos. With a 2MP rear camera, your expectations should be realistic. Stick with bright environments and don’t expect great quality photos. It’s still very much functional, but results are going to be less than excellent. I know my kids loved the camera and especially the Asus camera app presets so it’s not a total loss. My kids had a lot of fun tweaking their photos with the presets in the camera app. Quite honestly I would have almost preferred the better 2MP camera on the front of the ZenPad 10 for video chats but my kids would disagree with that idea! I am cutting Asus some slack on the 2MP rear and 0.3MP front cameras for one reason. From a cost cutting perspective, the lower quality cameras enabled them to put 2GB of RAM into the ZenPad 10 as opposed to 1GB. A 10-inch tablet for taking photos isn’t an ideal or very practical solution and the fact is the 2GB of RAM is going to be useful in every task the ZenPad 10 is used for. To me it was a good move by Asus. The benefit of more RAM supersedes better camera specifications in my opinion. 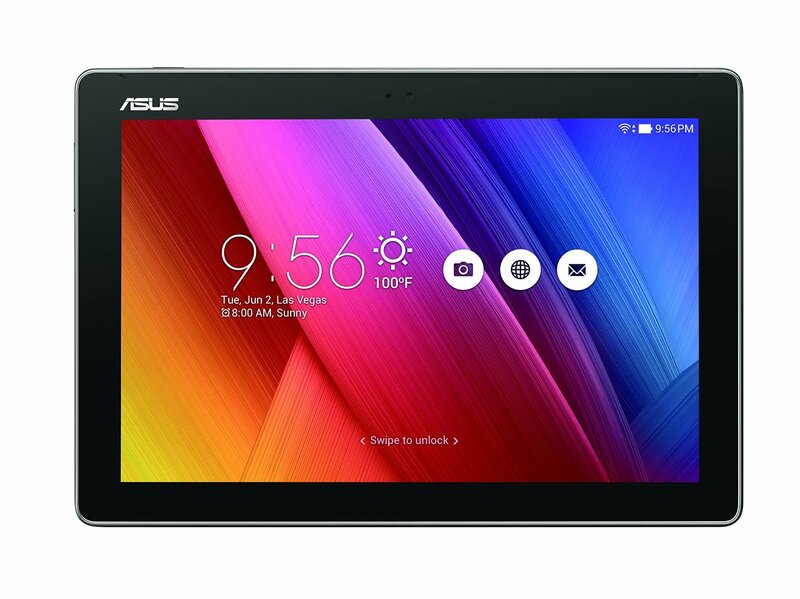 The ZenPad 10 series is compatible with the Asus Z Stylus which is a $29 US accessory. Pen input can be a real added value to a tablet and the larger 10-inch screen does give some interesting possibilities. I’ve had a chance to use the Z Stylus on the ZenPad S 8.0 (Z580CA) so I will provide some comparisons between the two tablets. The Z Stylus touts a 1.2mm writing tip, 1024 levels of pressure sensitivity along with 150 hours of battery life (AAAA replaceable battery). 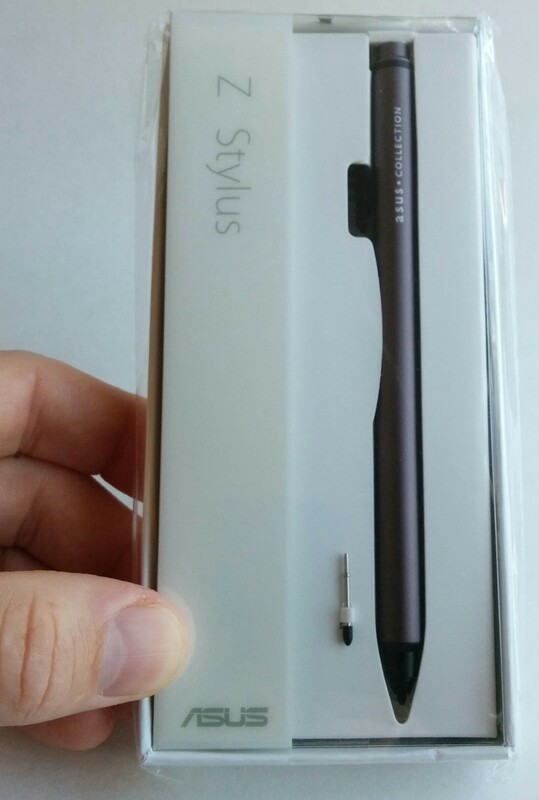 I enjoyed the feel of the Z Stylus and it feels the same in hand as a typical ballpoint pen. 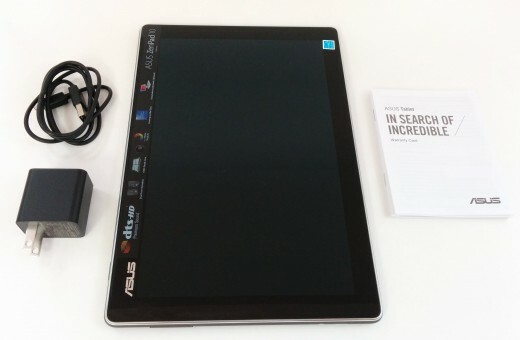 Asus provides a few pre installed note taking and drawing apps that are useful and function well with the Z Stylus. Thanks to some helpful suggestions from our site visitors, I’ve also used a few other note taking apps such as Lecture Notes. 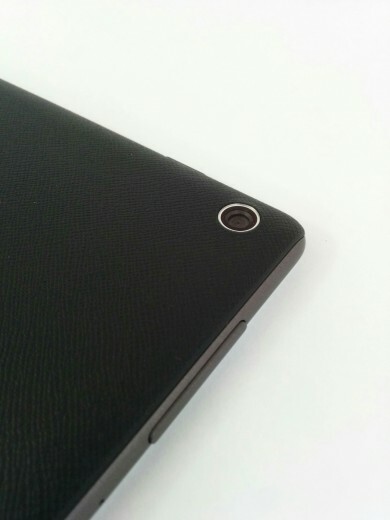 There are 2 function buttons side-by-side near the front portion of the Z Stylus. 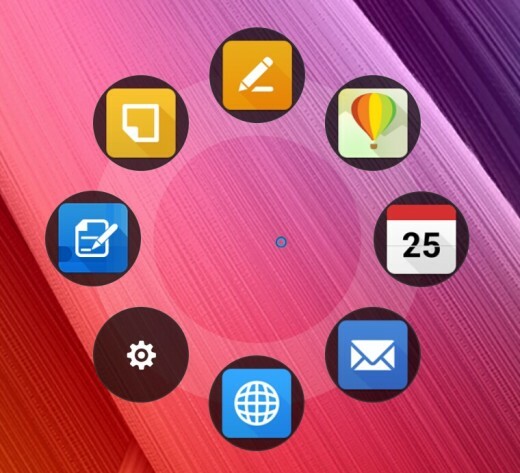 The main button, when clicked near the ZenPad 10 display will pop up the quick menu launcher. These are Z Stylus friendly apps, but you can pick and choose what apps show up in the quick launch menu. Depending on what stylus friendly app you are using, you can set the second function button to erase, although I didn’t yet delve into that just yet. 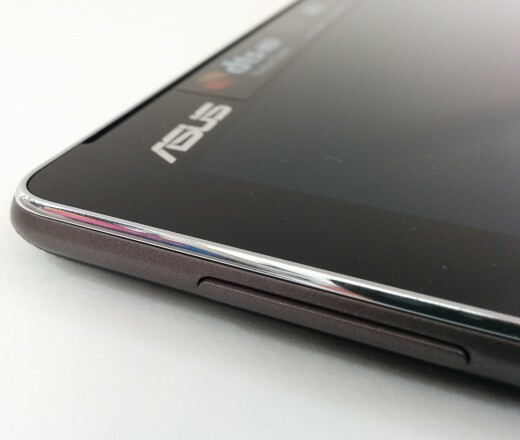 I will explore more functionality and details in my upcoming Asus Z Stylus review. I most enjoyed the Z Stylus when I enabled pen input only on Super Note and Quick Memo. Yes, the ZenPad 10 does have palm rejection technology but it’s activated when the pen tip reaches a certain proximity to the screen. There is a bit of a learning curve in that regard. More often than not I simply found it more enjoyable to take the guess work out of it and chose pen input only. It meant that I can treat the ZenPad more like a pad of paper. What I can say is that I enjoyed the Z Stylus more on the ZenPad 10 than on the ZenPad S 8.0 (Z580CA) simply because of more bezel. The ZenPad 10 has more real estate or “neutral” holding areas around the display which means a less frustrating experience from accidental screen touches. Beyond the advantages of a bit of extra bezel, of course being 10-inches allows for more “canvas” to work with. There is more doodling or drawing area! If you have kids, they will be grateful for that. The ZenPad 10 is built with a cheap price in mind. First and foremost the savings need to be understood because this is where Asus beats the competition handily. With a price as low as $157 US for a 10-inch Android tablet, there are very few competitors that come close. 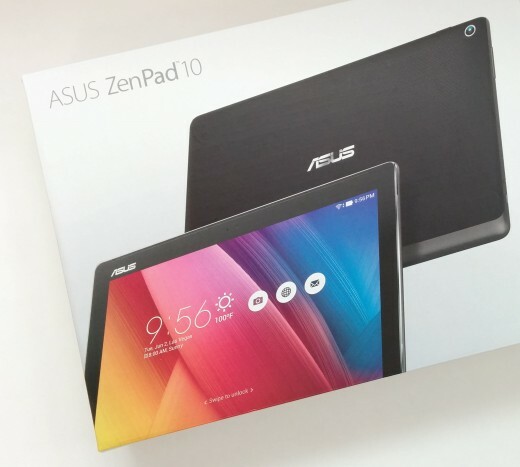 Asus priced the ZenPad 10 to the point where the competition can’t really touch it. The Amazon Fire 10-inch tablet is about the closest, but it is still more expensive and features the exact same resolution and similar hardware specifications as the ZenPad 10. Samsung offers lower end 10-inch tablets but again, you will pay more. Lenovo has a budget 10-inch tablet but it has rear facing speakers and lacks the versatility that the ZenPad 10 offers with a keyboard dock and stylus support. For me, the big selling point of the ZenPad 10 would be the rich sounding front facing dual stereo speakers. The audio really enhances the gaming, music and movie experience better than most tablets can. Not the loudest speakers, but certainly the nicest depth of sound that I’ve heard from a tablet. I also really liked the larger size of 10-inches for watching movies and playing games. The size makes it less portable but it brings with it a larger viewing area. It’s a trade off, but I personally think bigger screen size is better for what I need a tablet for. Another selling point is in the versatility the ZenPad 10 offers. The optional Audio Dock keyboard ($59 US) and Z Stylus ($29 US) accessories turn the ZenPad 10 into an even more useful device. A keyboard dock and active stylus are something that competing tablets just cannot offer. So you can essentially turn the ZenPad 10 into a laptop for just over $200 US. The real decision will be on the 1280 x 800 display and some of the shortcomings of that resolution on a large 10-inch display. Overall the content like movies and games look great, but sometime smaller text can have a less crisp look. If your eyes are trained on a high resolution device, like a retina display, then the small text clarity might be a bit more of an issue. For me, even though I’m used to retina displays, I found the clarity perfectly acceptable considering the price tag of the ZenPad 10. If I was spending more for this tablet then my expectations would be higher. As it is, the ZenPad 10 is a budget tablet and that’s how I’m looking at it. From a cosmetic perspective, it’s a great looking tablet. Performance wise, it can get the job done. The ZenPad 10 isn’t going to beat the competition in any one category, but the hardware and versatility thanks to the accessories make it a great value. Games and movies certainly provide a more pleasant viewing experience with the larger display, so there is some added value in the larger size of 10-inches. With sale prices as low as $157 US, the ZenPad 10 is a terrific value. Today I got an update for the Zenpad S 8 (64GB) WW_V4.3.2_20151030 that supposedly fixes issues with the Z Stylus, even the message that appear before the update said something about to have to enable the Stylus in settings after the update. It’s a 26.31 mb update. If you are rooted you need to flash back the stoct rom, don’t try to update before you are back to stock. After updating you can root the table using the same procedure as before. 1)Hi, how does it work? Is it per-app feature? If not, how do you switch between them? 2)And what about android task bar buttons, can you still accidently press them with your palm? 3)Any info how long Z stylus battery lasts? Hi there. Pen input is a app specific setting. I did check out the android task bar buttons and I didn’t find an issue with those in the Super Note app with pen input only setting. Not perfect, but less accidental presses the better. The battery I’m not certain yet. What I can say is beware about standby and having the Z Stylus set to on when you’re not using it. I found my battery dead, but I have the ZenPad 10 and ZenPad S 8.0 here and I’m guess with those having the stylus enabled, it was draining the battery. Hope this helps. More details upcoming! The perfect machine for a good price.